you could also try marins script ... that way the picture will be exactly like the map and you can even show events and the mc. 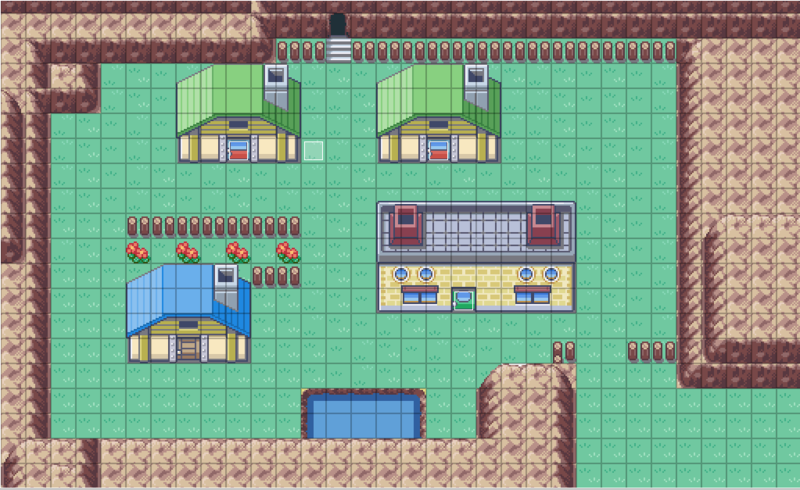 be aware that the Tileset graphic needs the same name as the Tileset in RPGXP though. 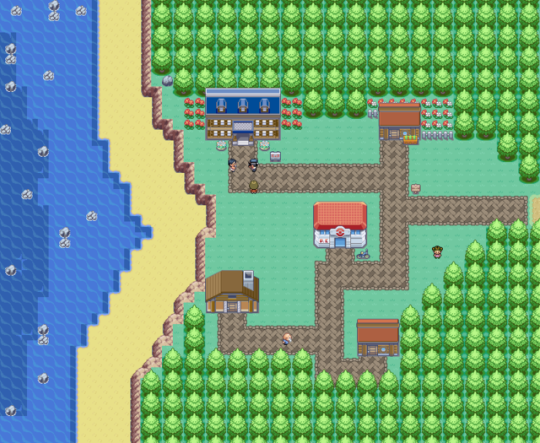 Been taking some babysteps using the Pokecrystal disassembly to make some maps for fun as I learn everything else. Inserting some bare tiles from the Spaceworld demo is nowhere as hard as I originally thought. This is an open world game- hence the lack of boundaries. You are meant to be able to climb/wander/walk/surf willy nilly to your heart's content. Some changes will need to be made just for my own person aesthetic values. OMG, its awesome! Congratz! REALLY!!! It's really very good! I can't even think like this xd. Wow, this map looks really impressive! It's kinda like you made a painting with just tiles! From a gameplay POV, it's pretty hard to give some actual feedback here, mainly because it is pretty zoomed out n_n" but Imma try nonetheless, so bear with me. First things first Open World =/= empty world. While your map looks amazing zoomed out, there are some very clear playability issues on some of the routes. The lack of paths will make a player lost, and the sometimes empty maps will feel repetitive as there isn't much going on on every individual section. I tried making this clear in the GIF in the spoiler below. The red rectangle is the default resolution of an essentials game. lack of structuring means the entire map, barring the borders, will just exist of grass, tall grass and a few trees. I know you have said you are aiming for a “true open world”, but I’d rather much prefer it if the amount of paths increased, rather than the size of them. 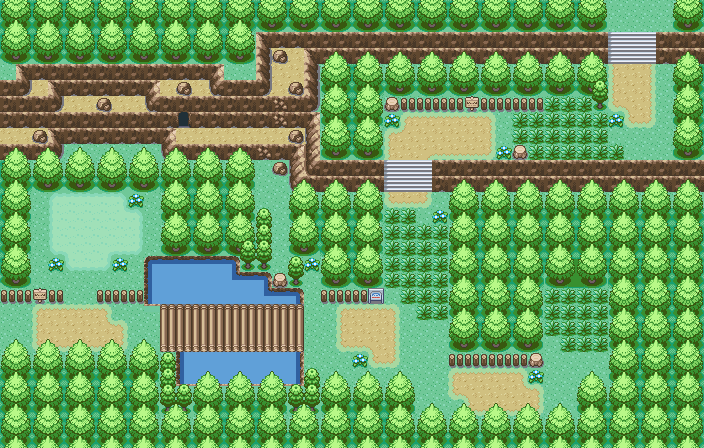 For example, fences, small elevation changes or trees, could slice that map into a few different paths. You’d still get the open world experience, since you can’t explore all the paths simultaneously. But you’d add enough structure to make sure the map doesn’t feel empty. Another general thing I noticed is that, from this level of zoom, the most detail seem to have been put in the borders between biomes. Most notably in the elevation. While I’m a fan of making more detailed borders like these, they only make the relative emptiness of your maps more evident. If you ever want more in-depth feedback on specific areas, send me a close-up version! If you manage to find the balance between aesthetics and gameplay I’m sure your game will be amazing! Thanks! That is really helpful. It's always a bit difficult to get a feel for the space in a game when you're just making maps. I generally tweak a lot of maps after I start doing my own demo. I definitely agree that empty maps get boring quickly. 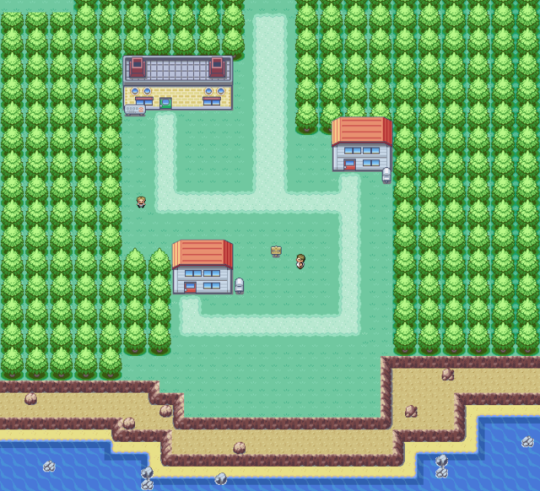 However, one of the elements of my game is all Pokémon are in the overworld, so the maps will be populated by lots of visible, moving, interactive events which may help to differentiate areas that otherwise seem common. 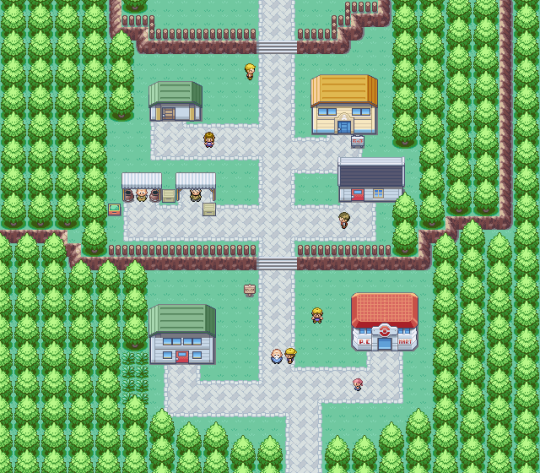 ( think a herd of zebstrika in the middle of a grass plain, a pidove perched on a tree, a diglet burrowing through some parts of the region) I'm hoping that, combined with trainers/ npcs/ etc helps to fill things in. Hello, it's been a while since I last posted but I'll post 3 maps if someone wants to post some feedback. 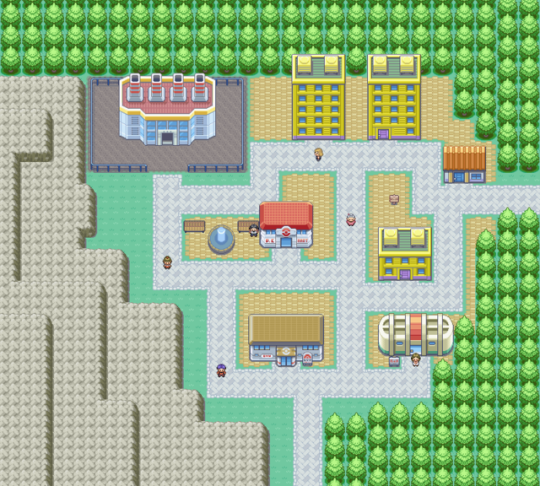 The starting town seems pretty spread out for so few structures, though that may be the feeling you wanted. I really like the overall feel and layout of your first route except for that little strip of exposed grass on the far left in front of the cliffs. It looks like it should be accessible, but it's not, which is irksome. Why not just add another row of trees? 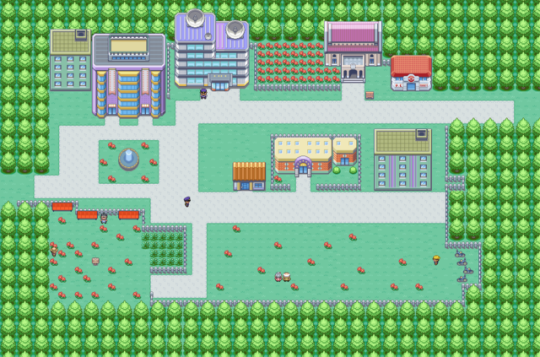 Similarly, with the second town the general layout is solid, but having the building's crammed so close together on this small town feels awkward - mostly with the house next to the gym - since they aren't exactly on an even plane. Hello. 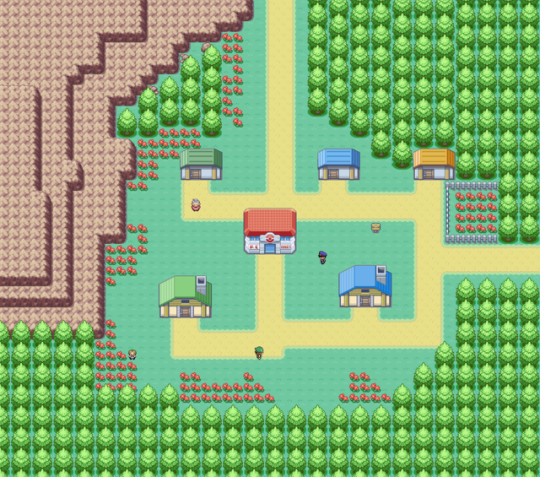 This is a first-draft map for my starting town. I plan to use other tiles as soon as I make them or get permission from others. For now this is what I planned to have. I have decided to show off all our currently mapped towns from our game. We have many more in the works, but some are yet to be named, while others have just not been mapped yet. The layout of the towns are not 100% set and we are open to revise them. Also, the names are open to change and we accept any suggestions. Your Maps are Awesome! I think they are very natural and beautiful.Also the Tilesets are Awesome too. The mountain part wasn't executed well — there are some tiles error in bottom left, top left and top right. 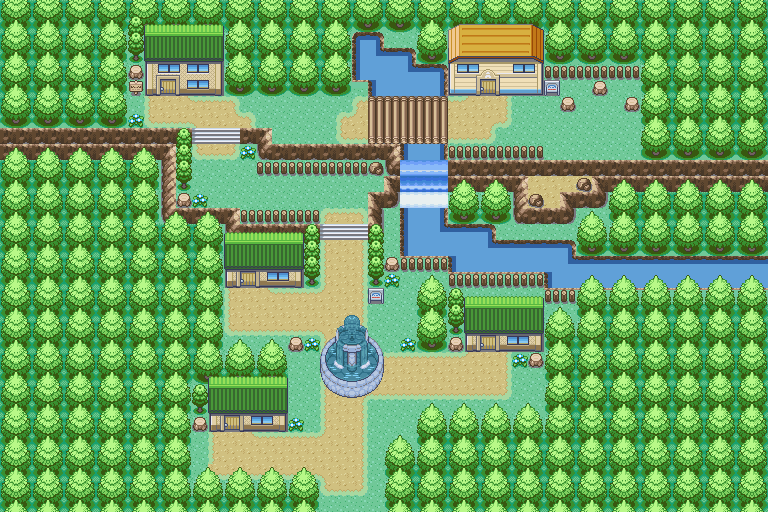 In the town's entrance, there should be land in the first layer, below the mountain tiles, and the same applies for the water. 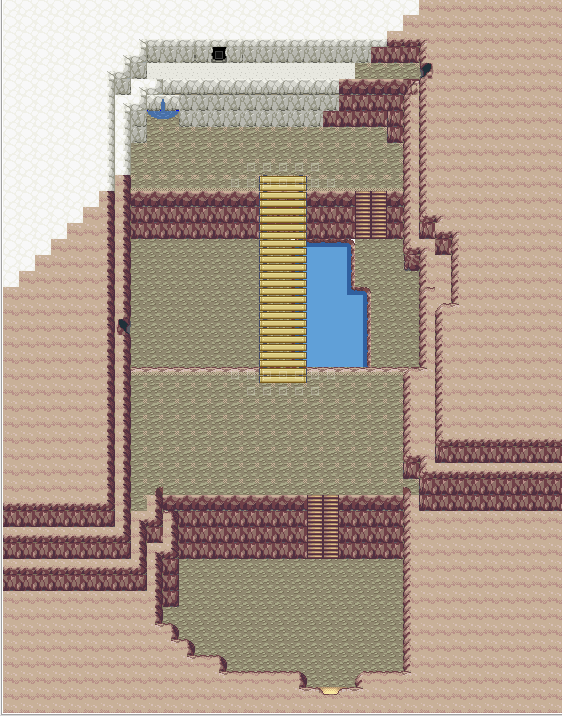 The stairs tile has no purpose there, since the entrance to the cave has no elevation. 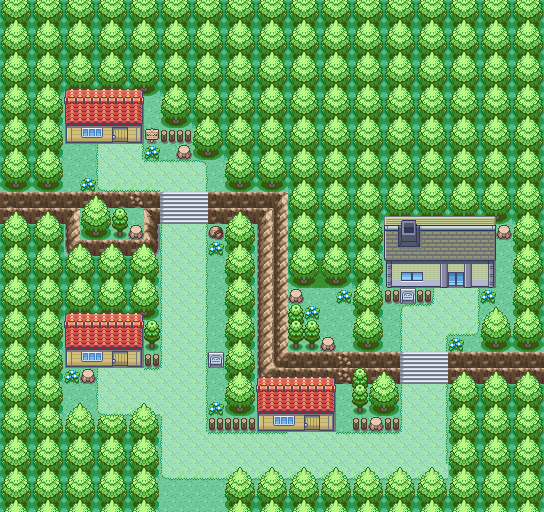 The town also lacks extra details, since the flowers are in just a small part of the town. 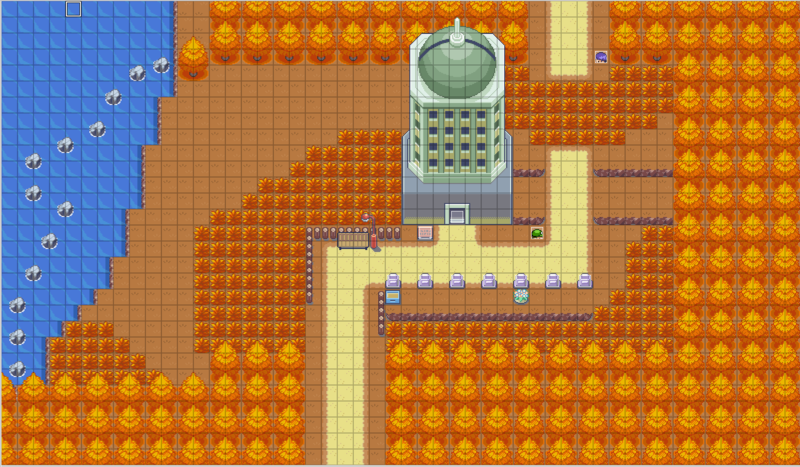 What do you guys think about this Atumn/Fall Map? It looks really good! 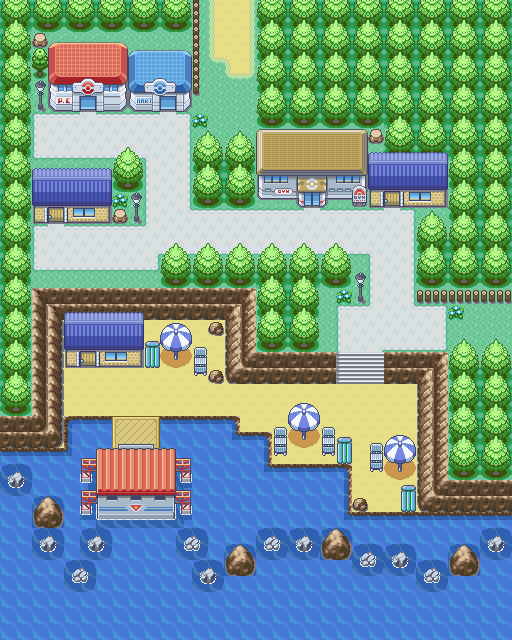 Only thing I would change is that fountain between the buildings-I'm not sure it's the same graphic style as the rest of your tiles, and it's in a weird position on the path.